Gorgeous Custom Built, Free-Standing Home with 2 Car Garage, ELEVATOR and Windows on All Four Sides with No Shared Walls!!! Home features Gracious, Spacious Rooms with 4 Bedrooms, 4.5 Baths, 2 Dens, 2 Car Garage with entry directly into the home, 5 Outdoor Spaces, 4 Exposures allowing for for 87 Windows!!! Custom Wine Cellar, 2 Wet Bars, Santos Mahogany Flooring, Crystal-like door handles and so much more!!! Impeccable Quality and Attention to Details is evident throughout this One of a Kind Home. Mahogany Doors open into the Carrara Marble Foyer, where youll find the Library with a Coffered Ceiling, Gas Fireplace, Wall of Built-Ins and Doors out to the Yard. A Wall of Windows allows Light to flood the home as you travel the staircase up to the 2nd floor. The Living Room offers a massive Bay Window, Soaring Ceiling, Gas Fireplace with Wood & a Travertine Tile Mantle, and a Powder Room. Gracious Dining Room and Gorgeous Custom Kitchen, with Carrara Marble, Glass Tile, Stainless Steel (Wolf, Subzero & Bosch) and eloquently finished with a Farm Sink, Wine Cooler, Expansive Island, Sitting Nook with Desk & Doors out to a Covered Porch. The 3rd floor features 3 Bedrooms, one could be a Den/Office, and one with a Walk-in Closet, Covered Terrace and an En-Suite Bath with Marble Flooring, Victoria Albert new Clawfoot Bathtub and Granite Vanity with Vessel Bowl Sink. Off the hall youll find a Laundry Room, and a Full Bathroom complete with Marble Flooring, Tiled Shower and an Ornate Dual Vanity. The 4th Floor begins with an Open Foyer offering a Wet Bar, Wall of Windows and a Rooftop Terrace with incredible Sunset Views!! Private Master Bedroom Suite, complete with a Vaulted Ceiling, Gas Fireplace, 2 Walk-in Closets and Spacious Full Bathroom with Carrara Marble, Jacuzzi type Tub, Ornate Dual Vanity, Spacious all-tile Shower and Watershed. Sliding glass door leads out to a Rooftop Terrace with Expansive Views of the City. The Beautifully Finished Lower Level boasts a Gas Fireplace, Wet Bar and a Full Bathroom. Retrieve to your Personal, Custom Detailed Wine Cellar, suitable for approx 750 Bottles with Wood Trim, Stone Wall, Air Purifier and Exhaust System complete with Built-Ins, Shelving, Wet Bar, Wine Cooler and Custom Wood Countertop. 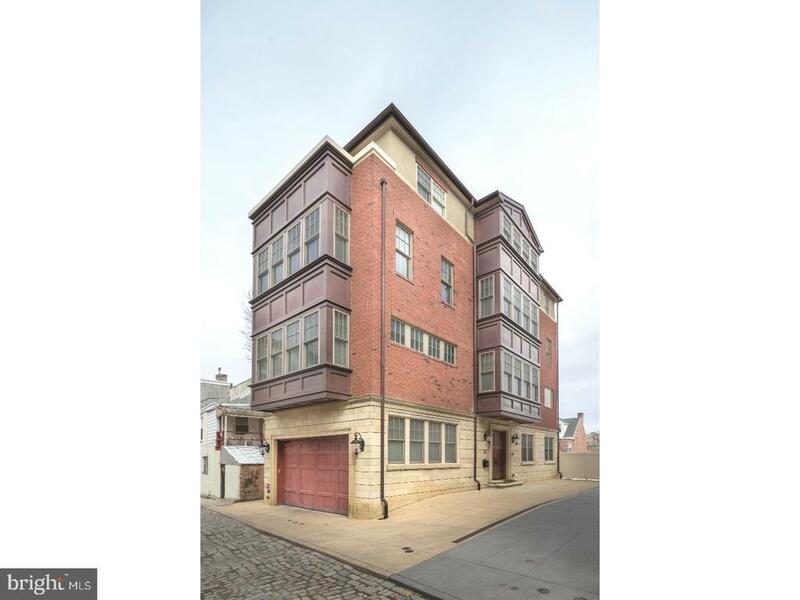 This Spectacular Home is nestled on a Quiet, Cobblestone Street with no thru traffic in the Heart of Queen Village, just a stroll from the Shot Tower, Headhouse Square, Parks, the Waterfront, Restaurants, Cafes, etc. Directions: Take 2nd St south past Christian, Salter St is immediately on the left.